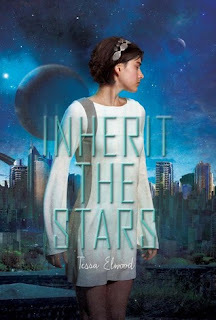 Inherit the Stars was a great book that I don't regret reading, but I definitely had some major issues with it. First of all, I loved the family aspects of the book. Asa—the protagonist—put family above everything else in her life, and she really struck me as a person with a lot of resolve. She always tried her hardest to do what was best for her family. The dreaded insta-love trope (that is so common in YA books and so annoying) was avoided, and truly I loved how Asa and Eagle started off as reluctant partners and gradually became closer. Speaking of Eagle, he was a great and complex character with well-developed and realistic flaws. While he began as distant and moody, by the end of the book, he had undergone a tremendous amount of character growth, and it was just wonderfully executed. Unfortunately, I had several problems that kept me from completely loving the book. One of the biggest was how little world-building there was! Coming from a person who's always had a deep interest in astronomy, there is so much room (and need!) for details and explanations in a sci-fi fantasy story involving outer space travel and multiple solar systems. Instead, I can't even name one thing about appearances, landscapes, or general features of the planets. Not only this, but I am missing an explanation as to how the characters travelled through space within a matter of days. Despite these very odd scientific mishaps that perhaps I'm nitpicking over, it was the ending that disappointed me the most. Basically, two pages from the end of the book, just when I felt like it would take another book to resolve everything—every single issue was fixed instantly and in the most lucky, convenient way possible. It was a pretty big let-down. I would have preferred a cliffhanger and an entire sequel for a better and more reasonable conclusion. Overall, I would recommend Inherit the Stars, though I did have some annoyances that kept me from falling in-love. It places a huge value on family, and while the weird science and the ending were lacking, the characters themselves and the writing really made up for it! 1) The book placed a great emphasis on the importance of family, and Asa puts her sisters who she is very close to—Wren and Emmaline—before everything else in her life, and it was touching to read. 2) No insta-love! The romance truly took a long time to develop, and the characters got to know each other instead gradually. It was a slow burn, and it felt natural. 3) Eagle was a great, realistic character. He had his flaws, because he was distant and reluctant at first, but he really developed throughout the story. 1) There was basically no world-building in this book—although different planets and solar systems give so much room for it! It is frustrating that not even one feature of the planets travelled between throughout the book was mentioned, which took away from the story. 2) How did they to travel between solar systems in a day? I need to know!! 3) The ending was SO rushed. A conflict that should have taken a separate book to resolve was quickly cleared up on the last page—it felt completely forced. I expected more and I expected better. The brown of his eyes echoes in his lips. Warmth and wonder like life is this shiny, beautiful thing. No wonder he smiles so rarely. Everyone would forget how to breathe. I did notice how developed the politics of the world were, but I would have preferred some world-building too. Thanks, and I thought Eagle was such an interesting character! The weird science stuff also bothered me as an astronomy buff, but I loved the pacing of the romance. You nailed this review! I'm also really interested in astronomy, which is probably why I noticed all of the odd science behind this book. I remember being so excited for this book back when I first heard of it!! But it's one of those books I requested and just lost interest. It's not helping that I'm not such a fan of the cover. I really wanted to read this book but after Nikki's review I'm not so sure. I actually rated Sword and Verse 3.5 stars, I thought the pacing in the book in general was strange. Oops I meant to say Nikki. Sorry about that! Thanks! I'm also not a huge fan of the cover, and that's one of the first things that gets me interested in books. The ending was a major problem that I had with the book, and it affected my rating. It's important for a book to finish well and wrap things up. I couldn't finish this book. I just couldn't get past how there was so little of everything. I felt like I didn't know the world or the characters. Yeah, specifically the world felt underdeveloped for me, and I couldn't picture it at all. I have a hard time not finishing books, because I always need to know how they end. Thanks for the review--I haven't heard about this book before today. I appreciate the detailed likes and dislikes you have here--I will skip reading this one as I need good world-building and really dislike convenient endings.